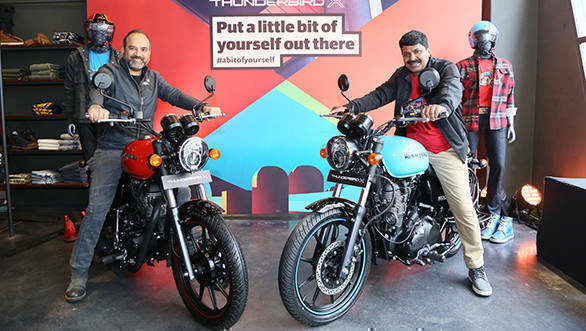 Royal Enfield has launched the new 2018 Thunderbird 350X and Thunderbird 500X in India at Rs 1.56 lakh and Rs 1.98 lakh, respectively (both prices ex-showroom, Delhi). The prices of both models are approximately Rs 8,000 more than their standard Thunderbird counterparts. These Royal Enfield Thunderbird X models have been designed as custom-inspired motorcycles for urban explorers, the company says. 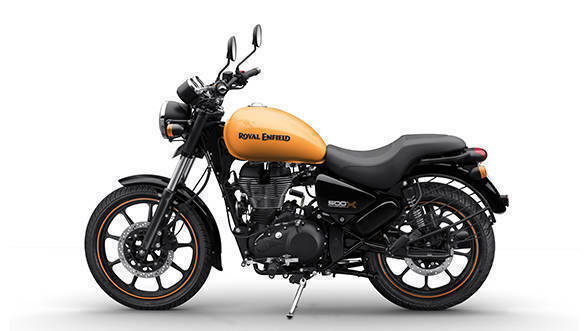 The Royal Enfield Thunderbird X models are available in four new colours - Getaway Orange and Drifter Blue for the Thunderbird 500X and Whimsical White and Roving Red for the Thunderbird 350X. These bright paint options only cover the fuel tank on the new Royal Enfield Thunderbird 500X and Thunderbird 350X, while the rest of the components including mechanicals, mudguards, headlamp casing, side panels and exhaust are all blacked-out. This gives the Thunderbird X a more modern, custom-built look. The Thunderbird X models share their mechanicals with the standard Thunderbird, and come powered by the same 499cc and 346cc air-cooled fuel injected single cylinder UCE engines, respectively. Other cosmetic changes include the addition of alloy wheels for the first time since the Royal Enfield DX 175 Fury, as well as lower and flatter handlebars for a more standard seating position, and rim stripes to match the paint. In addition, Royal Enfield has also given the Thunderbird X a narrow, contoured one-piece seat. There is no longer a large pillion backrest, which has made way for black rear grab rails on either side. There is also large 500X and 350X stickering on the side panels. Bookings on both Thunderbird X models have commenced from today and deliveries will begin in a few days. Royal Enfield has also stated that the standard Thunderbird will continue to be sold alongside these new models.